Various studies have shown that there is a close correlation between a persons working performance and the temperature of the office environment. There is no maximum working temperature laid down by law, but the Health & Safety At Work Act and The Offices, Shops and Railway Premises Act both demand that workplace temperature must be 'reasonable'. Accepted zone of thermal comfort for UK offices lies between 16ºC and 24ºC World Health Organisation recommends a maximum working temperature of 24ºC Employees and workers have stated that their performance and productivity decreases and their stress level increases if their working environment is too hot or too cold. 81% find it difficult to concentrate in the office if the temperature is higher than the norm 62% of these admitted that under hot and steamy conditions a typical task may take up to 25% longer than usual to complete. 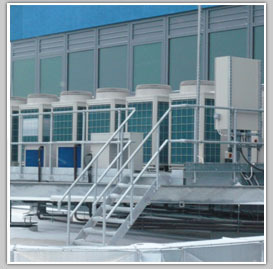 Cooltek provides solutions for heating, cooling and fresh air supply for all environments.